A EULA is a critical component of your product offering. Without it, you are exposing yourself to lawsuits, unmitigated copying and redistribution. Not only that, responsible enterprises won’t use your software unless you provide a EULA (that’s easy to access) for the corporate legal department to approve (or contest if there’s something in there they don’t like). Without a EULA, you’re not even in the game. So you have your own legal counsel write up a EULA which consumers must accept before they can use your components. But it’s not that simple. To maximize the reach in your addressable market, you may want to offer your product for different software platforms. So you may have a Docker version, an RPM, an npm package, a NuGet package for your .NET customers and anything else that’s relevant to your markets. Each variant of your product may be released on a separate schedule and must have its own EULA attached to it, which could make EULA management very troublesome. Bintray addresses this issue with the concept of “Products”. 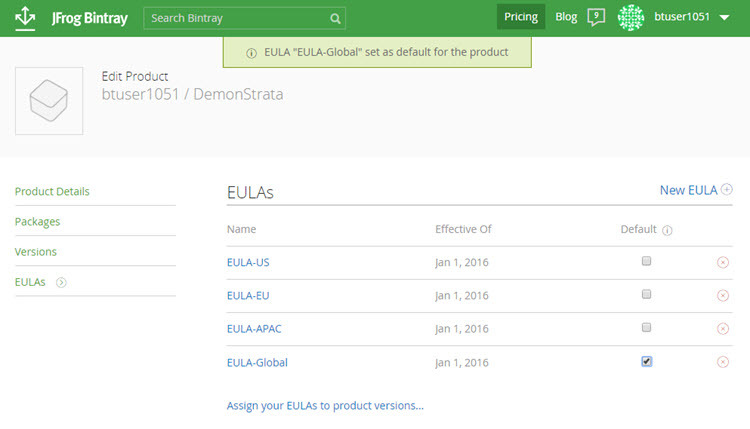 By including all the different variants of your software in a single Bintray product, EULA management becomes trivial. Once you assemble the different variants of your software under a single product and assign it a EULA, you can update the version of any component in that product without having to worry about the EULA. That is managed automatically by Bintray. What if you want to limit download to a defined set of users? And what if one of those users is actually an automated script (which will be quite common). You create an entitlement which gives access to your product, and then you provide the corresponding access key to your user. Your user then browses to a specially constructed Bintray URL. Bintray displays a login screen where your user enters the access key as the username and its password. Bintray then displays the EULA for your user to accept. From now on, any REST API call that includes the access key you provided to your user will succeed since the EULA has already been accepted using that key.